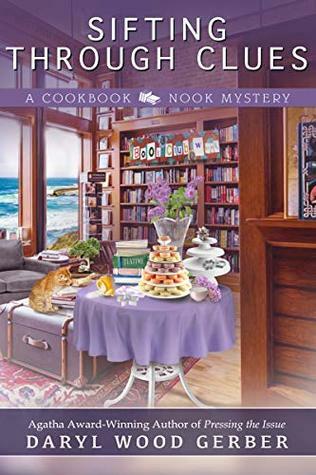 Amy Clipston's Bakery Bunch is a group of readers who enjoy Amy's writing, are eager to support and promote her work in creative ways, and are becoming good friends as a result. I'm excited and honored to be a part of this group! It's not a one-way street either, because Amy is always reaching out and encouraging us also. For example, one of you will receive a copy of a very special book from Amy, entitled A Gift of Love - details are at the end of this post. And then there's this little something that started around a month ago at Amy's house (click on images for a larger view) . . . 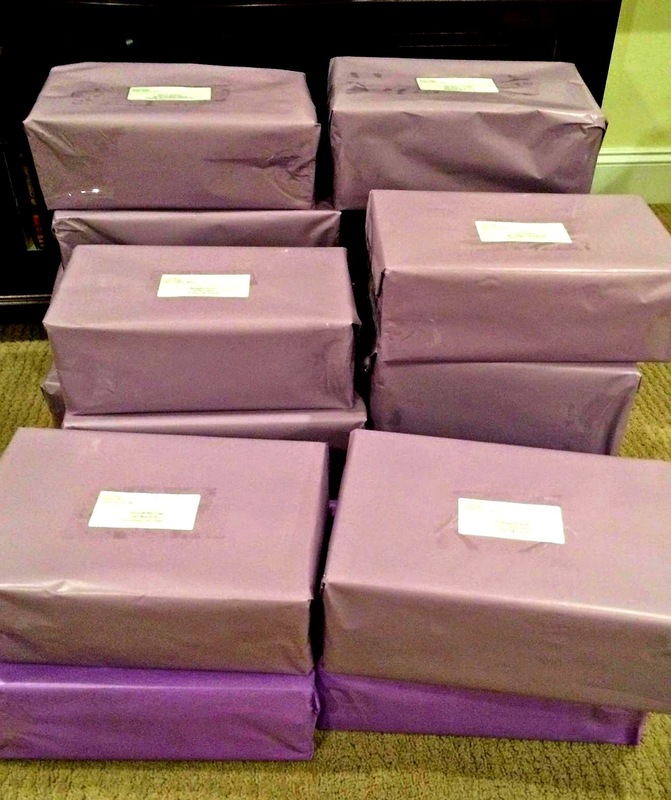 The surprise box arrived in December and it was so much fun to open it under our Christmas tree. 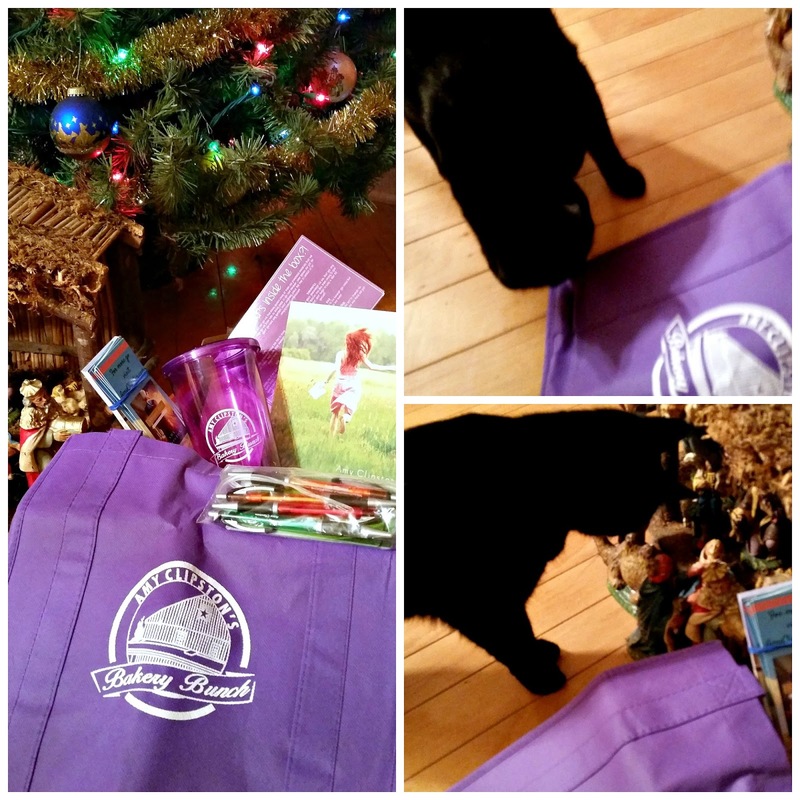 Book, shopping bag, luggage tag, tumbler, bookmarks, pens - I thought for sure that Ebony would detect the scent of Amy's cats and want to check everything out . . . but NO! He went for Mary, Joseph, and Baby Jesus instead. Oh well! Now let's see how all these items can be used to promote Amy's writing as I journey through my week . . .
First of all, there was an ARC of Amy's new YA novel, which will be released in April. Most readers, like me, probably associate Amy with Amish fiction . . . Who knew?! Although I haven't had time to read Miles from Nowhere yet, I did read the first couple of chapters last night - BIG mistake! It's the same high standard of writing we've come to expect from Amy, and very hard to put down. I will enjoy reviewing this one soon! 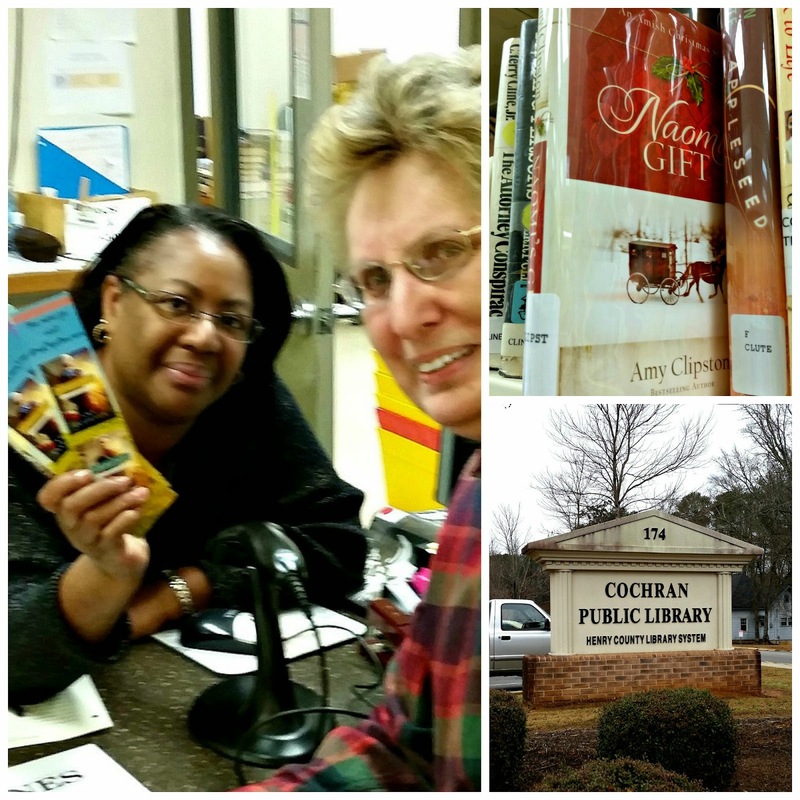 I love my library! The librarian appreciated Amy's bookmarks and was glad to have her picture taken. Amy's books are so popular that there was only one on the library shelf! 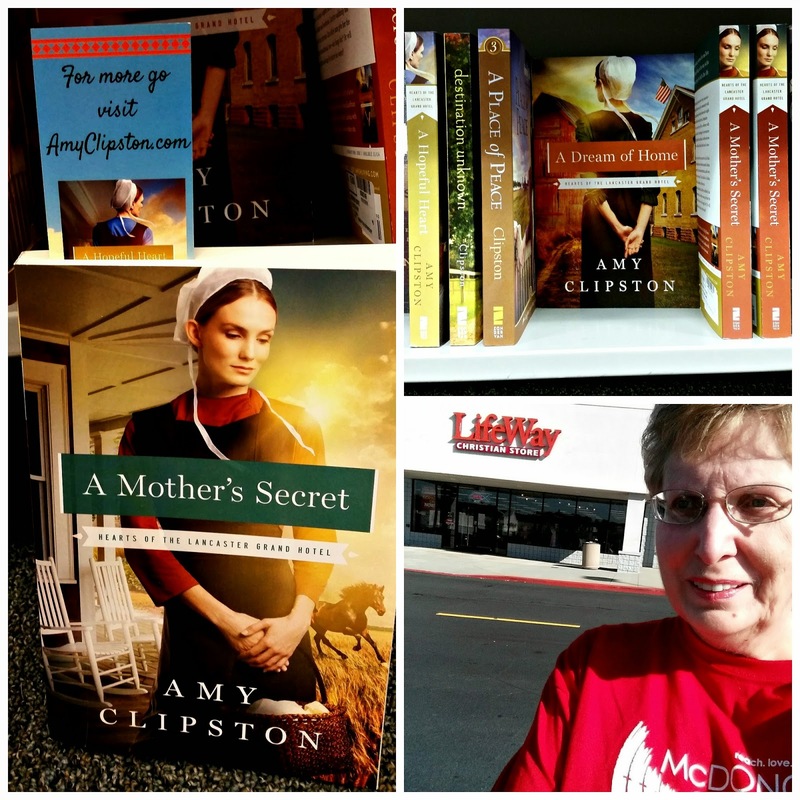 The LifeWay store in Morrow, GA is always a good place to visit and several of Amy's books were in stock. They must have some strict policies, though, because I wasn't allowed to place bookmarks in Amy's books nor to take a picture. However, the clerk did say that the bookmarks would be displayed for customers. 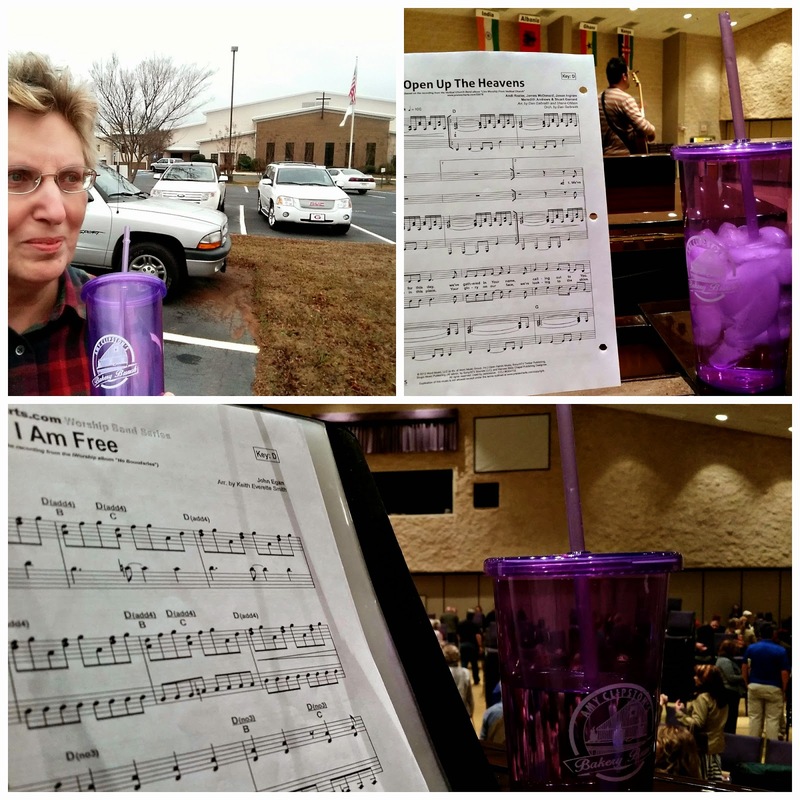 The tumbler, truly a traveling cup, goes with me almost everywhere - from working on my blog, to practicing a piano solo, to relaxing with my computer jigsaw puzzle game. It's also a great way to work on those 64 ounces of water the health experts say we need each day. By the way, I loved the computer blog photo on Zac's post, so he gets the credit for that idea. Thank you, Zac! From Wednesday morning Bible study, to Thursday night worship rehearsal, and finally worship on Sunday . . . What a great conversation starter! 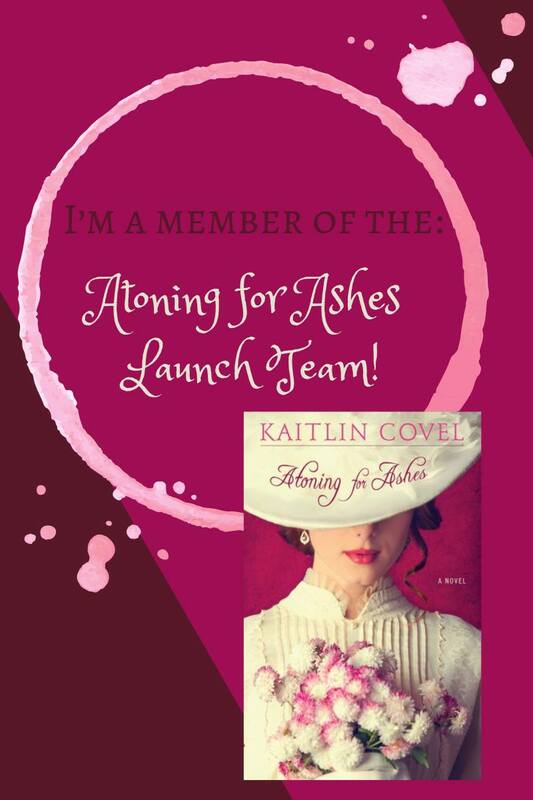 Lots of my friends read and most enjoy Amish fiction - but not everyone is familiar with Amy's books, or knows that she has a new one coming out soon. 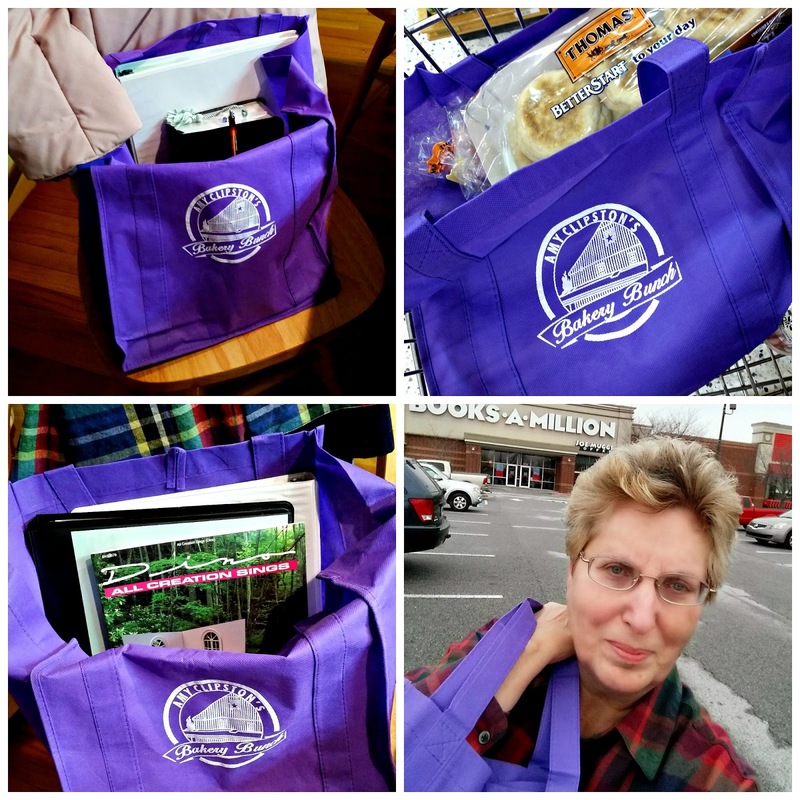 The shopping bag has really come in handy because it seems I'm always carrying lots of stuff - whether it's for Bible study, grocery store, worship band rehearsal, or actually shopping. And this is another great conversation starter. The luggage tag Amy sent will be used in the future, but right now it's kind of lonely. My daughter has lived in Germany for six years, where she leads a campus ministry, and every visit during those years has resulted in the taking of more luggage over there, where it somehow manages to stay. So now whenever I visit, I have to borrow a friend's luggage. But wait! I can write her a letter . . .
Wow! I wasn't sure I could ever pull all this together. But it's been fun, I learned a little more about my Smartphone, and this has helped me realize how we can do more to creatively support the authors we enjoy. My thanks go to Amy and all who shared in this project. 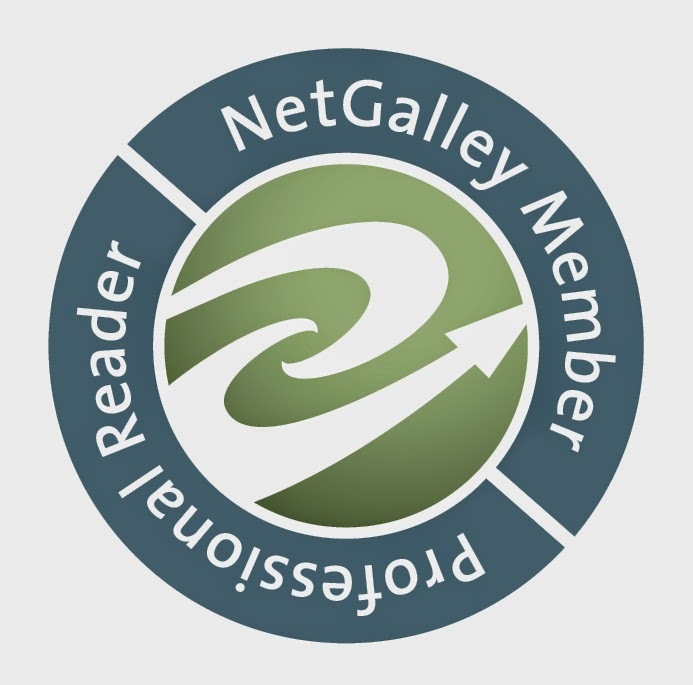 Do you enjoy Amish fiction? Are you familiar with Amy's books? If so, do you have a favorite book or series? Do you enjoy YA stories? Have you read any of Amy's? Are you a blood donor? Have you or a loved one benefited from someone's donation? Don't forget to leave your e-mail address in a safe format. Contest ends on Wednesday, January 28, US addresses only. Carol, I am not a blood donor but my oldest son is and I am so proud of him ! I always love Amy Clipston books and have read all the Kauffmann Bakery series. 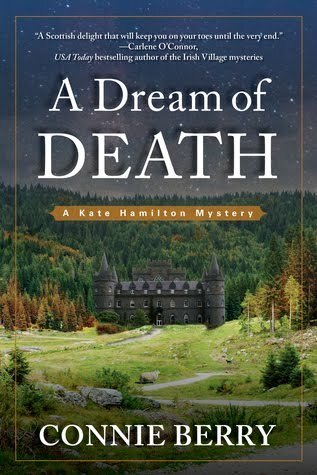 I have not read the Lancaster series but Amy Clipston is one of my favorite authors. 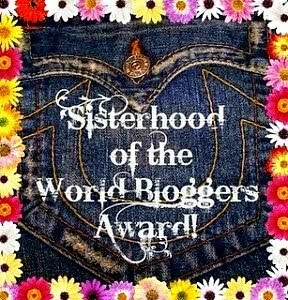 I woyld really love to win this because Amy Clipston is my 20 year old daughters favorite author as well and we would share this. You have good reason to be proud of your son, Deanne! Giving is so easy that I don't see why more people don't do it. And I think it's wonderful that you and your daughter have that connection with reading and Amy's books. Amy Clipston's Bakery Bunch sounds delightful! How fun! I do enjoy Amish books although I don't know if I've read Amy's.. I need to start a list of books I've read as I do enjoy getting books from the library too :) I do enjoy YA stories & no I've never donated blood. Deanna, I'm almost neurotic about keep a list of all that I've read, and all that I want to read also! I created Excel files on each author, which works well for me. It's tempting to spend more time on organizing lists than reading, though! Thanks for visiting today, Deanna. I am a blood donor, but have never personally benefitted from someone's donation. But my SIL definitely has when she had her baby. She bled out twice. I'm so thankful for the donation of others, because that saved her life! Well said, Kate! Thank you so much for sharing that. Amy will enjoy hearing this. 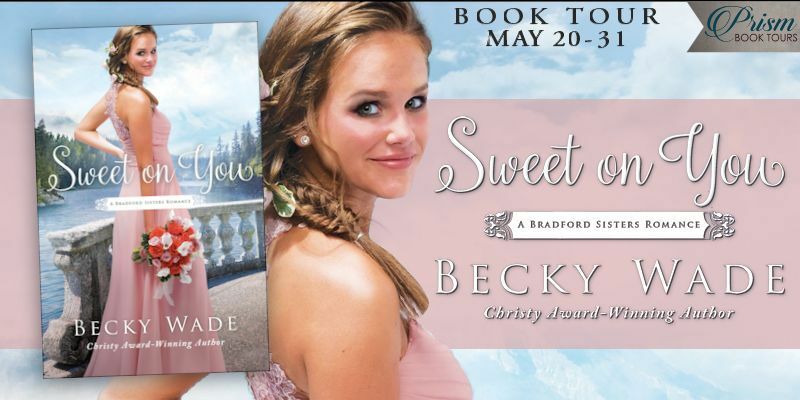 I do enjoy Amish fiction but haven't read any of Amy's books, and while I love the Amish people - their simplicity, food, crafts and convictions, and love touring Amish communities: I would love to read "The Gift of Love" as I love true stories. It also would have additional meaning to me since I had a kidney removed due to cancer. Bonnie, I enjoy Amish fiction for all the reasons you mentioned and while I'll probably never get to visit an Amish community, I sure would like to. 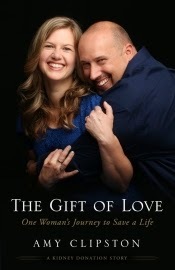 I don't read as much nonfiction as I'd like, but knowing Amy's heart and a little about her story makes me eager to read "The Gift of Love" soon. With your experience, it would really resonate with you, Bonnie. And I hope you know how much I appreciate all the sharing you do. Love you, Bonnie! I can answer all your questions. My husband is a blood donor. We have all of Amy's books in the church library.My favorite book is the one you are giving away. I did not put it down until I finished it. Even though our YA section of the library is very small I would love to find more books like hers to add to our collection. Wow, Janet! That's high praise indeed, and I can't help but agree with you. Thanks so much for sharing. I have read and loved all of Amy's books except this one and her YA book. I myself cannot be a donor but my late husbands life was prolonged by several months with the help of donated blood. It's good to hear testimonies like yours, Jackie. Thank you for sharing. LOVE, LOVE, LOVE "The Gift of Love!" Amy is such an inspiration! The book was very helpful to me also to know what to expect with kidney donation as I will be donating to a friend in 8 days. LOVE ALL of her books!! Wow, Debra! Amy's book became very personal to you, didn't it? I pray that all goes well with your donation and would love to hear back from you afterward. Thank you so much for sharing with us. I'm the same on those two things, Sheila. Thanks for stopping by. Have donated blood and was happy to do it. Loretta, I was challenged to donate blood many years ago when the blood mobile came to where I worked. There really wasn't anything to it and I've given ever since. Thanks for visiting today. Sonja, it sounds like Amy's book would be a blessing to you. I pray God's blessing on you and your father. Rhonda!, you certainly understand the value and importance of donation! Thank you for sharing with us. Hello Carole. I have some of Amy's books. Read my first of hers from my Library. I believe the title was A Simple Amish Christmas. I do love my Amish books. I am not a blood donor. Was told I have been enemic too many times. And, yes my Husband died with cancer. He had many blood transfusions.Thank GOD for those who give their blood. I really loved the Kauffman Bakery series. So far I've liked all I have read. I've been wanting this one. Sure would love to win it. I would love to win Amy's book. I have never donated blood, due to health reasons. But so admire those who can and do.. 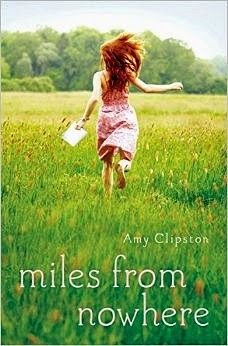 I'm very familiar with Amy's books and have read many of her Amish fiction, as well as her first YA. The one that I've wanted to read so badly is this one, her personal story, but have not been able to afford to take the money from our very tight budget to purchase. We live in a fairly small rural area and our local library lost a lot of it's funding and is not able to add more books to it's collection. If I were to win this book, after my daughter and I read this book, I would then donate it to our library. Amy's a wonderful author and so sweet. It's been so nice connecting with her on Face Book. We've interacted many times and she's become a friend. She's also helped answer many questions my daughter has had about writing (she's a self-published teenage author) as well as answering questions to help my daughter with projects/reports for school. Thanks for the entry into this giveaway. I am a blood donor, but I do not know if my donation has ever helped anyone. In 1981, however, I was the blessed recipient of much needed blood. I had to have an emergency c-section, and I lost so much blood that a transfusion was needed, and since I was in a Naval hospital, I'd like to think that the wonderful feeling I had after it was all over was due to some amazing service member donating their blood to me! PS....I own and have read all of Amy's books, and I loved them all! I am an organ donar. I've donated blood several times over the years. I read the Kauffman Amish Bakery series & loved it. Amy has inspired me to visit Bird In Hand which I plan to do this coming week! I've donated blood before, & I also donated a kidney to my husband in July 2014. As a matter of fact, my husband and I met Amy & Joe for the first time the weekend before my husband's transplant. We had dinner together at Olive Garden and we've been friends ever since! Although I'm familiar with Joe's story, I'd still love to read Amy ' s memoir. I love Amy's books. We go to Amish country at least twice a year every year. I am a blood donor and have given over 12 gallons. I am also an organ donor. I used to donate blood on a regular basis since 1979. But due to an incident while I worked at the hospital in 1992 I'm no longer able to donate :( My son and father benifited from blood donors from 2004-2007 while going thru cancer treatment. I enjoy all your books. cr8ted4him@frontier.com says that you are an amazing and talented writer. I have read your books and will read them afain and looking forward to your new ones. I love Amy's books and I have read the Kaufman Bakery series. I have never been a blood donor but I have been the recipient of blood during chemo when my counts were very low after treatment. I was very grateful. I have read several Amish fiction books. 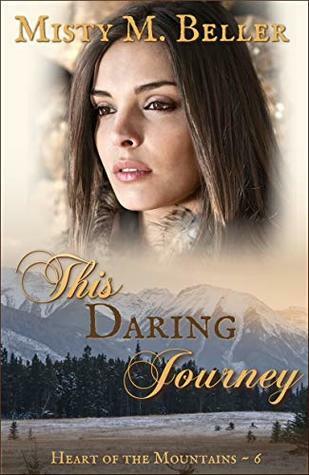 I'm not sure if I have read any of Amy's novels, but I have read one of her novellas in collaborative Amish fiction and she is a great author!! I enjoy Amish fiction...I have visited Lancaster, PA numerous times. Thanks for the opportunity to read Amy's story. I read A Mother's Secret and enjoyed it. Her new book sounds really emotional and deep! I have recently started reading Amish books and now I can't get enough. I have not ready any of Amy's books yet. Thanks for the introducing me to her books and I hope to read many of them! I love reading Amy's books. I'm just getting into her YA series. And I can't wait to read this book! I'm registered as an organ and bone marrow donor, and I've been giving blood donor since I was 17 (the pressure of having a parent working at the Red Cross). But honestly, this is something easy I can do for 3 other people! You're welcome, Diana, Dawn, Theresa, and all the other many recipients of everyone's donations! I'm up to 3 gallons and I'm not stopping! I have read all of Amy's books, right from the start and including "The Gift Of Love" and have had the pleasure of meeting with her a couple of times as well as e-mail contact for several years. Love talking about Lancaster County, her years in Virginia Beach (where I also lived for many years). She and her family are a treasure and delight, and so happy to call her a friend. Being a type 2 diabetic, I am not a blood donor though I am a specified organ donor on my driver's license. My oldest daughter donates blood regularly and so proud of her! padt73[at]hotmail[dot]com I have always had an interest in the Amish people. We had a community that settled in our county many years ago. I believe some stayed and have now taken over the country store in that area...Burkes Garden, VA. They also sell their goods at our local farmer's market. My husband does farm business with a guy in a neighboring country. I also taught a student whose father was Amish and left. No, I am not familiar with Amy's books, but they look like something I would enjoy. I have recently started reading Amish stories and I must admit that I am surprised at how much I am enjoying them. Yes, I have been the recipient of blood products. Approximately 18 years ago I was in a horrific auto accident which landed me in the ICU just shortly after my daughter was born. Multiple trauma to my body resulting in a ruptured spleen and the need for massive amounts of blood products. Only by the grace of God. Yes I have read some of Amy's novella and loved them . Yes I do love Amish books and read them by several different Arthur's . No I am not a blood donor , I have always had to take blood . I would love to win this book of Amy's . Thanks for the chance . I really enjoyed this post. You are doing a great job promoting this author (who I hadn't heard of before by the way!) Thanks so much for sharing at Booknificent Thursday!